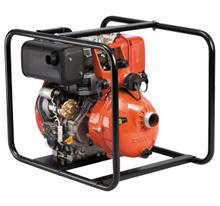 Davey’s range of fire pumps come with versatility and flexibility that can make them adaptable to many applications. Firstly, the pump inlet is incorporated into a compact suction housing, with easy access to the suction flap valve and the other pump internals. The suction housing comes standard as 1½” BSP but is available as 2” for larger horsepower models and in NPT threads for selected markets. And to ensure the fastest self-priming times, the twin impeller models feature a larger suction housing allowing for easier filling for priming and draining for after use. The new bayonet style priming and draining plugs incorporate a decompression function and safety retention system, and with a simple 90 degree twist of the wrist, the plug can be released. Davey’s unique clamped impeller design allows for optimum impeller shape and internal surface finish for increased performance. Amazingly, this patented feature also makes it possible to quickly disassemble the impeller/s, making cleaning accidental obstructions easier. Patented independently floating neck rings are also fitted both front and rear of the impeller to ensure optimum pump performance is maintained, even after months or years of abuse. A 3 or 4-way discharge allows for easy installation and more connection options with 1, 1½ and 2” outlets, and a conveniently positioned handle and comfortable grip that saves on weight without compromising strength. All centrifugal pumps are capable of subjecting axial (parallel to the shaft) thrust to the engine. 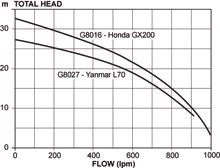 The higher the pressure the greater thrust potentially created, which can shorten engine life. The 5 Series Firefighter® range incorporate a thrust balance drum and pressure equalization holes in the impeller, extending engine life. They also feature the resilient, high quality Davey powder coast finish on the inside and out, helping to extend the life of your new Davey pump.